Chocolate Bunny digital pattern booklet is finally available in my SHOP. My Easter patterns didn't quite make it in time for Easter this year. The good news is that they will be early for next year! 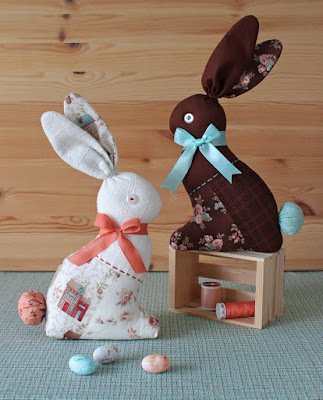 Sometimes it's difficult to create what's in your imagination and these Easter patterns though simple proved to be challenging. 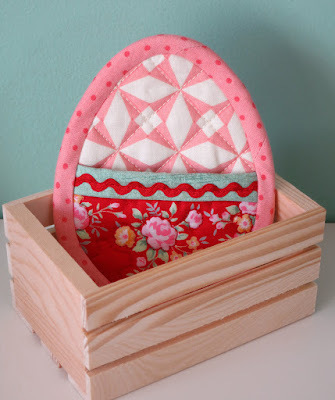 My Easter Egg PotHolder/Pincher design although pretty was lacking in function. It ended up being way too small but I decided that it was too cute to chuck and I finished the binding anyway. 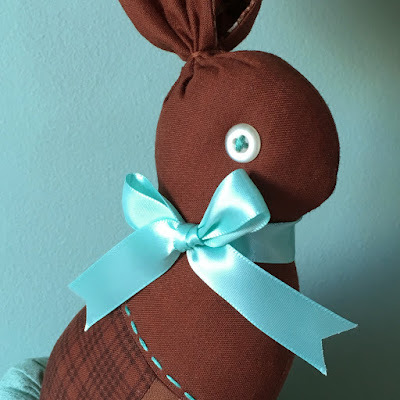 So I moved on to my Chocolate Bunny design which took a total of 8 prototypes before I got the shape right. I was thrilled with how it turned out! Then I came down with a nasty sinus/head cold and couldn't work on the illustrations. 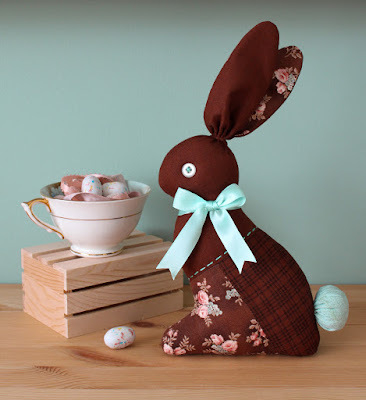 Chocolate Bunny is a simple pattern suited to crafters of any skill level! 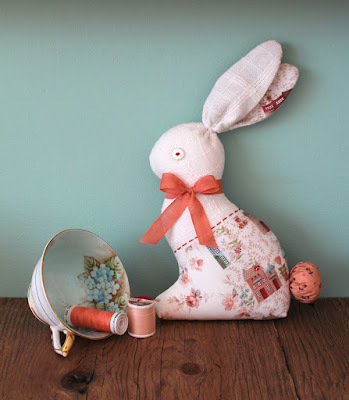 This scrappy bunny is a perfect way to use up your fabric scraps and leftover ribbon. Based on the shape of a traditional solid chocolate bunny, it would make the perfect Easter gift and would last for more than just a day! 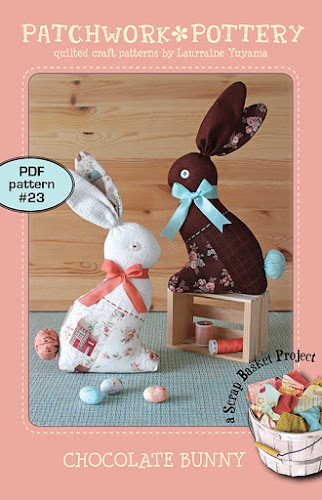 Download this digital PDF pattern, print it out, assemble it into a little pattern booklet, and have fun sewing! PatchworkPottery patterns include metric conversion chart, stitches & terms section, illustrated step-by-step instructions, and full size templates. Hope you all had a Happy Easter filled with chocolate! 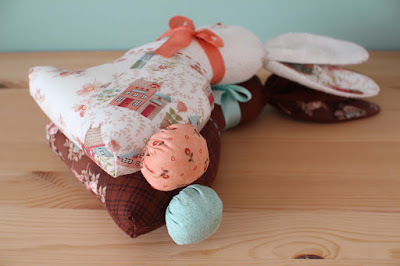 Wow, they are so cute, Happy Quilting! 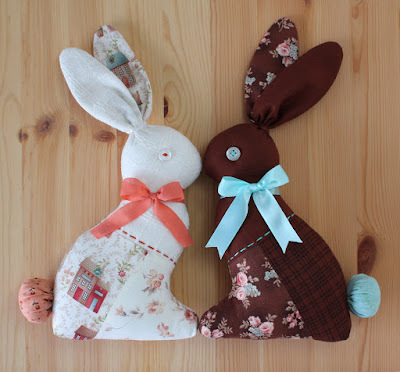 So cute...but is the Pincher Pot Holder too small to use to pick up a cup of coffee from the microwave? I sometimes heat up water in a mug and the handle is hot,,,could your little egg be a handle pincher? nice quilt design, love the design.